This entry was posted in Uncategorized and tagged chapter book, chapter book challenge, Homeschooling, life with little ones by Charity Hawkins. Bookmark the permalink. 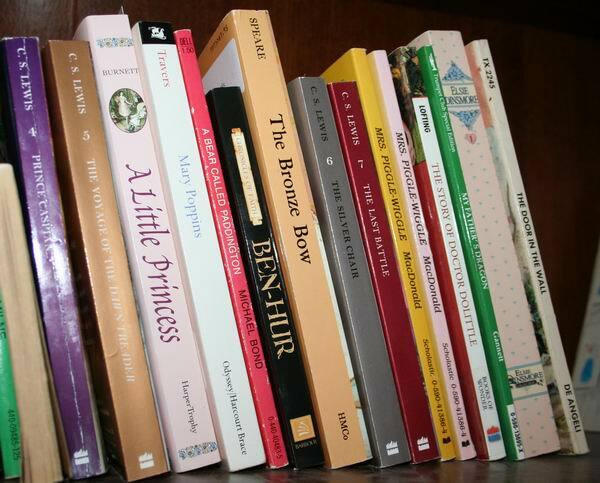 We’re planning to read the Anne of Green Gables series plus The Trumpeter of Krakow at the end of the year. Jeanine, I’d love to hear your report of Anne of Green Gables, and I’ve never even heard of the Trumpeter of Krakow! Thanks so much for sharing! I just read Anne of Green Gables again last year to myself and I had forgotten how funny it was! L.M.Montgomery was brilliant with dialogue! Have fun! I am hoping to do some reading with all my spuds this year. Spud1 is 9 and we are doing Farmer Boy (did Little House on the Prairie last year, she loved it! We did the lapbook off of homeschoolshare along with it), Charlotte’s Web, and The Moffats. Those are all part of her curriculum for this year. I want to read them as a family though along with Spud2 (4yrs) and Spud3 (2yrs) and Spud4 (when she arrives). We are kind of doing a combo year this year of 3rd and 4th grade, she is officially 4th but last year was our first year homeschooling and we spent a lot of the year just getting her up to speed on stuff that she was missing out on in public school and seeing where she was at on things. If we finish those books quickly I will start The Lion, the Witch and the Wardrobe, Heidi and Lassie Come Home. I don’t want to set my goals too high and be disappointed if we don’t reach them I have a new baby coming after all! Love the “Spuds” Too cute! Those sound like a good list–I’ve had The Moffats and haven’t gotten to it, so I’ll be interested to hear your review. Know that I am in awe of you if you can read with your 4 y.o. and 2 y.o. in the room! I have to do it when my 3 y.o. is sleeping. Otherwise I spend half my time trying to get him to be quiet! How do you do it? Oh, and good for you for not setting goals too high with a new baby. It does take a while to get back into the swing of things! Need lots of time for just cuddlin’. I really don’t know how I do it! Lately they are just begging me to read to them. I they will bring me stacks of 10 or 20 books and want me to read them. They will sit there and listen as long as I will read to them. On our trip earlier this month I was reading aloud to my husband, he was driving, from the Durango/Silverton train guidebook we bought while on our trip. If I stopped reading the kids started telling me to read more. All I can say is I hope it continues! Fun! This is also one of my goals. We are actually reading Narnia The Magician’s Nephew right now and will go on to The Lion the Witch, and the Wardrobe next and so forth. Will review on my blog once we are done reading each book. I even sport an english accent for the characters, hehe…my husband records me. *sigh* he’s just jealous he’s not as cool as I am when I’m british. Oh, that’s awesome. I wish I could do the English accent! I’m interested to know what you think. I was thinking they are getting (with The Horse and His Boy and Prince Caspian) awfully complex on plot and vocabulary, but my kids still seem to be enjoying them, so I guess we’re still okay. Look forward to your reviews Deanna! Don’t forget about the option of audiobooks in the car. We read a lot at home, but we listen often in the car. Heidi is a must read. It’s beautiful. Oh yes, audio are great. Thanks for mentioning that! I have never read Heidi, just seen the old movie, so I’m looking forward to it. Thanks for letting me know! I started a tradition a while back of reading my kids a chapter book during lunch time. I figured the food would keep them occupied. I can usually eat faster than them. They are in 7th & 2nd this year. You would be surprised by how much the little ones are paying attention to. I would read chapter books to my son, when my daughter was really little, and she would often tell me details of the story later. We are currently reading Treasure Island. We love the Series of Unfortunate Events series (not for everyone). We finished Book 9 before this book. I’ve read them all the Little House on the Prairie books (not The First Four Years). We have also read the first few of the Redwall series. If I think of more, I’ll come back and post again. Checked my list for this year. Here are a couple additions to my previous comment. –We read The Phantom Tollbooth (I would wait till your kids are older, was hilarious, but I had to explain a lot to my 6-year-old). –We read Winnie the Pooh for the 2nd time – probably my favorite children’s book. –Mr. Popper’s Penguins – I would give it 2 stars out of 5. Haven’t read Farmer Boy yet, probably will this school year. Did read it to my son when he was little, but not my daughter. We love the Pippi Longstocking books, will probably read one again this year. Also enjoyed the first in the Saturdays series, by Elizabeth Enright. Want to read the second in the series this year. I have The Secret Garden on my list, but we watched the movie and it seemed a bit depressing. Put the first of the Ramona books on my list (Beverly Cleary). Not sure if I will like it, as a parent, like I did as a kid. Character issues really stick out to me now as an adult. Shannon, thanks for sharing all those great ideas. I have not heard of the Redwall series, so I’ll put that on my list to check out. I remember being read the Phantom Tollbooth in my 5th grade class. Can’t wait till mine are old enough for that one. My kids enjoyed Mr. Popper’s Penguins, but they are younger, so maybe that’s why. I didn’t think it had fabulous, enduring themes though. They love Pippi as well and we loved Little House books too. Thanks so much and I am interested to know what they (and you) think of Treasure Island! Currently we are in the middle of a dragon study as part of ICR Science and our Dark Ages unit study, so we are reading: Daughter-11th grade-Bryon Davis, Starlighter Series (almost finished with book 3, she can’t put them down). Son-9th grade-Bryon Davis, Dragons in our Midst Series, (still on book one). Sons-2nd and3rd grade- Dragon Stew and other library books. Son-college and working- sadly has no time to read. And myself- waiting for Amazon to deliver Frank Peretti’s The Oath (this will be a re-read from years ago). Husband isn’t working on his own reading right now, but has been read to by the second grader! Later in the school year we’ll be reading The Whipping Boy, Canterbury Tales, Robin Hood, and The Midwife’s Apprentice. Wow, we haven’t done any dragon books. You’ll have to tell us what you think. We just listened to the Whipping Boy audio and I really liked it. Great message for kids! We read The Whipping Boy a couple years ago, it was good. There is a book that we loved with short stories about dragons – http://tccl.bibliocommons.com/item/show/1321644063_the_book_of_dragons – with fabulous illustrations by Michael Hague. 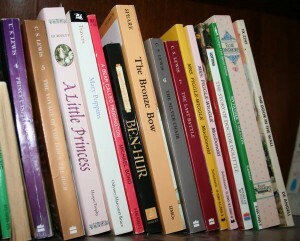 Some or all of them are excerpts from longer books. We didn’t read every story. We read the excerpt from Voyage of the Dawn Treader, about Eustace; excerpt from The Reluctant Dragon (that’s a good book, too), excerpt from The Hobbit, and I believe the two stories by Edith Nesbit. They were fun short stories that the kids liked and then we later read the full books of Dawn Treader and The Hobbit. We’ve read a handful of books by Edith Nesbit, too, and they have all been fun. My husband is currently reading the original Wizard of Oz and we realized there are many sequels we aren’t familiar with. So he will probably continue those. We requested Farmer Boy (we’ve done the first 2 Little House books) on interlibrary loan, so that will be the first. From your list above, I may try Dr. Doolittle. I remember loving it as a child. After that it’s usually whatever audio books I can find at our libraries. I’ll update as we go! I rely mostly on audio books because at bedtime I still like picture books and my sweet little girl started Kindergarten today so we lose many hours with that. I hope we can get to Anne this year! Especially since I’ve got a dramatic little “Anne” in my house! Kate, Thanks so much! I read your list. It looks awesome and I look forward to your reviews. We are doing Sonlight this year, which is ALL chapter books! I’ve never heard of many of them which makes it exciting for me too. Quite a few are historical fiction and the kids think it’s awesome when I can show them real photos online of places in the books. We just finished “Red Sails to Capri.” You can see all the titles on their website. My 6yo can’t comprehend what my 8yo can though, so he has his own set. We do some at lunch and some at bedtime. I don’t make the 6 yo or 5 yo sit through the 8 yo stuff, but they listen to their own stuff together and my 8 yo reads on her own at that time. Yes, I love Sonlight books. I need to go look at their list of ancient history related ones. I know we liked the Pompeii easy reader one. Great idea to look up real photos online! Thanks for sharing Kim! I like your idea of a challenge– gives me something to rise up to! I’ll have to do some research to see what I’d like to hit the rest of this year and keep you posted!